On Friday since I was in Downtown LA, I wanted to stop in Little Tokyo. My son was suppose to go with me since he didn’t have any classes on Friday. Well you know young men, he couldn’t get up and I didn’t want to wait until the afternoon on a Friday for such a long drive. I did drive in a few circles, but made my way to the parking garage under the Kinokuniya bookstore. Well while browsing through the embroidery books I saw one on YoYo purses. I looked though it and thought for 20 dollars I would remember the idea, so put it down and continued browsing. I did find a couple of other books, one that had beautiful photos of antique embroidery and projects based on the different styles. I post about that later in the week. Getting back to the YoYo book, well, I picked it up to look at the detailed instructions to burn the idea into my memory a little better. Then I noticed it was a system for attaching YoYos together without cutting the thread, into squares that fit together in a way I would never have thought of on my own. There is one other detail I will save as a surprise since it is also out of the norm of YoYo crafting that I have seen. Now there is one glitch. To make the basic bag I need 100 more YoYos than I have. 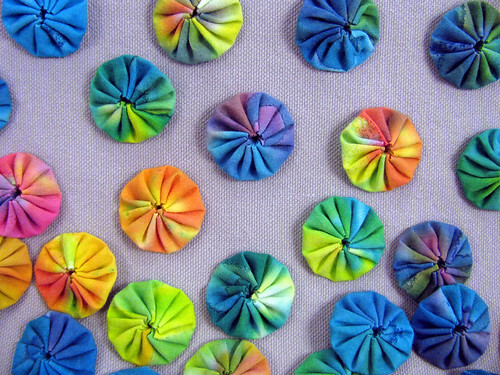 I used up all the scraps of this tie-dyed fabric but I have been wearing tie-dye now for many years with lots of scraps left-over. As soon as I get the other 100 made and sewn into squares I’ll post. Also I am using PhotoShop Elements now to correct the levels of the my photos. So the color now is closer to reality, brighter and less yellow. This entry was posted on Tuesday, November 11th, 2008 at 3:00 am and is filed under Sewing. Tagged: Sewing, Tie-Dye, YoYo. You can feed this entry. You can leave a response, or trackback from your own site.